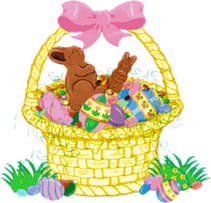 I will be receiving the list of sign-ups for the Easter Baskets by March 30, 2019. You will let me know if you would like to participate in making a $25 - $30 Easter basket or donating a $25 gift card. Additional details for drop off will follow, which will take place around April 14th. We are also continuing our partnership with Fiske's in Holliston. You will be able to pick your basket at the store, get 20% off items and they will put your basket together! Join us March 10th for a Clothing Swap from 2:00-4:00 pm in Holliston! Feel free to bring quality men's, women's and children's clothing to swap. We'll enjoy beverages and snacks while we mingle and swap! After the Swap, whatever clothing remains, we'll be happy to donate. Please RSVP to juliannecatlin@gmail.com for the host's address. Children's Activities: St. Patty’s Day Bowling! Let’s come together for some bowling fun on St. Patty’s Day, Sunday March 17 at 10:30 am at Ryan Family Amusement in Millis on Rt. 109. The cost is $5 per person, $20 family max for the lanes, and each person will be responsible for renting their own shoes. I will need to know how many lanes to book, so please RSVP with how many will be bowling to the Facebook event or via email to juliannecatlin@gmail.com. 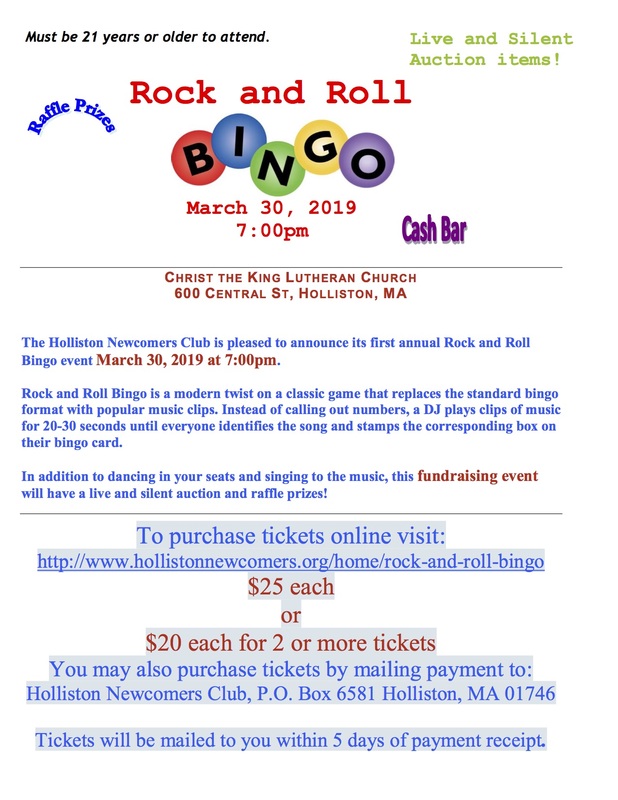 Thanks to the generosity of local businesses, dozens of items have been donated for auction and raffle that will ultimately support the charitable, civic, educational and recreational events and activities that Holliston Newcomers Club members hold dear. A professional DJ and Emcee create an evening of high-energy entertainment and laughs for everyone to enjoy. Guests play bingo set to Rock and Roll music, while they bid on auction items and cheer each other on as people sing and dance at their tables. A goal of the the Holliston Newcomers Club is to give back to our community. One of the ways this is accomplished is in the form of grants. Grant money is raised during the various fundraising activities held throughout the year. The 2018 fundraising events that contributed to the 2019 Grant fund were Princess & Superhero Party, Touch-A-Truck, The Great Pumpkin Trail, and Gingerbread House Decorating. The Community Investments Committee publishes the availability of the grants, collects and reviews grant requests, and proposes the distribution of the grant fund. Participation on the committee is defined in the by-laws. This year the committee members are Christel DiPippo (HNC President), Robin Bowman (Fundraising Chair), Beth Welch (member >5 years), Sue Hatton (member <2 years), and myself (member at-large and chair). The grant criteria and application were approved at the January General meeting and published to the community through The Holliston Reporter and Holliston Facebook pages. The committee is currently reviewing those submissions and will present the requests and the committee’s proposal for approval at the March General Meeting scheduled on Wednesday, March 27th at 7:30 pm. This is the membership’s opportunity to give input into this important process. The Community Investments Committee can also be reached via email at HNCCommunityInvestments@gmail.com. We are delighted that they have made a commitment to Newcomers and the community in 2019 and welcome other local businesses to do the same. We are a volunteer-run organization and the support of generous individuals and businesses is what keeps us going. To learn about the different levels of corporate sponsorship, please click on http://www.hollistonnewcomers.org/sponsors. The Holliston Newcomers Club will organize and arrange a meal to be delivered to new parents. Please let me know if you or another club member are expecting! We are happy to do this and will be respectful of time and meal preferences, special diets and food allergies. Remind your newcomer friends that if they have not been receiving their newsletter - they need to renew! And if you know of a past president who wants to reconnect - send me their name & email. We’ve had a lot of great member-only events so far this year, so make sure your friends don’t miss out on what’s coming up - send them this newsletter so they can see what’s happening - they can join anytime! March will be a busy month for the Newcomers Club! We will be holding a Special Meeting on March 6th at 7:30 pm at the Holliston Historical Society located at 547 Washington Street. The purpose of the Special Meeting is to discuss and vote on the rebranding of our club. Then on March 27th, also at 7:30 pm, we will have a General Meeting during which we will review the grant proposals prepared by our Community Investment Committee. This meeting is a great way to learn about all the amazing projects the Club funds in our community. All members are invited and strongly encouraged to attend both events! Kindly RSVP to katrinegioux@gmail.com if you plan on attending a meeting and let me know if you wish to have any discussion item added to the agenda. These next few months will have a lot of fun social and fundraising activities, and we look forward to seeing you at many of the events. Please keep in mind that we need each member to volunteer at least two hours of their time to help this club run smoothly and enable the tradition of giving back to Holliston that has been kept alive for nearly 50 years. Keep an eye out for electronic sign-up opportunities. Check out all of the following articles and see what works best for you. Feeling shy? Bring a non-member friend to one event and join in. This club is only as fun as you make it and we’d love to see you!